Nanostray is a frantic traditional sci-fi shoot em up game on the Nintendo DS. Will it blast you into another dimension or shoot you down cold? Video games may not be known for their elaborate plots, but Nanostray simply does away with any kind of story altogether. Instead, in this DS shooting game, it's just you versus a whole bunch of aliens. Then again, for such an unashamedly old-school shooter, who needs a story anyway? 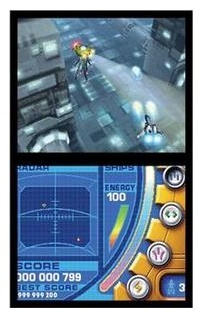 Gameplay is spread over 8 stages which represent 8 different planets. Each stage scrolls vertically and throws various aliens into your path. As they fire all manner of projectiles your way, you quickly realise they are not friendly. Fortunately your ship is armed to the teeth with a variety of weapon systems, which can be activated by tapping the touch screen. There's a powerful forward firing beam, a shot which fires out of the sides of your ship, less powerful shots which home in on their targets and a wiggly laser beam. Each of your weapons come in handy at different points in the game, or they would if they could be easily selected. The problem is that the action is always so unrelenting that looking down at the touch screen to choose a new weapon is almost certainly suicide. Because of this, you're much better off simply picking one weapon at the start of the stage and hoping that it will suffice for the rest of the level. Fortunately, it usually does. Apart from the touch-screen activated weapons, your ship also carries a powerful beam weapon, which can be charged by collecting blue coins, and several screen-clearing smart bombs (the exact number depends on the difficulty level chosen). With all these powerful weapons, you might start to feel invincible. However, your ship is only very lightly armoured and can only withstand a limited number of hits from enemy flak and will be destroyed instantly should you be unfortunate enough to collide with an enemy. The graphics in Nanostray are of a high standard, though only one screen is ever used for the action. The enemy ships look great and the game uses the DS's 3D abilities to render some great looking hunks of space metal. Sound effects are also strong and the game benefits from being played with headphones, thanks to a catchy soundtrack. Each stage is only a few minutes long but does not feel overly short (you're kept perfectly busy during that time) and ends with the obligatory boss battle. Here you have to fight a particularly tough and well armed enemy. Most players will save their smart-bombs for this encounter. Because smart-bombs reload after a life is lost, the bosses can be dealt with easily by releasing several of these powerful weapons. However, more experienced shoot-em-up players will relish the challenge of fighting the bosses without bombing them into oblivion.